The CoffeeShop Blog: Time to pull out the camera! Time to pull out the camera! Why not take a few minutes and take some photos of your bedroom or the kid's playroom? Don't clean up too much, you want your photos to really reflect your daily life. Believe me, you will love looking at these photos later. My father is German and he grew up in Bremen, Germany in an apartment where my grandmother still lives to this day. This apartment has one bedroom, 1 bath, 1 living/dining room combo, and a tiny kitchen. During WWII they had over 10 people living in that tiny space. I visited my family in Germany many times over the years, and since then most of them have passed on, including my grandfather. My grandmother is in her 90's and legally blind, but still lives alone in her apartment. My uncle helps takes care of her, but she still manages to be pretty independent. As a child I always had my little camera with me and I have quite a few photos of German cobbled streets, scenic overlooks, the Bremen Town Musicians, beautiful flowers, and relatives. 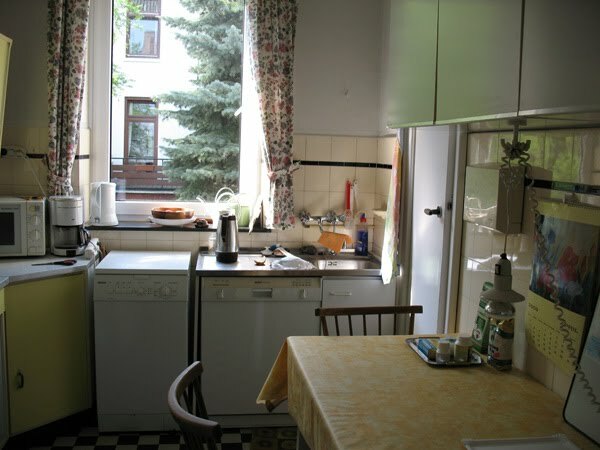 But I didn't have any great photos of the apartment that I spent many of my summers visiting as a child. My mother and father visit once or twice a year and I asked my mom to take some photos of the apartment for me. 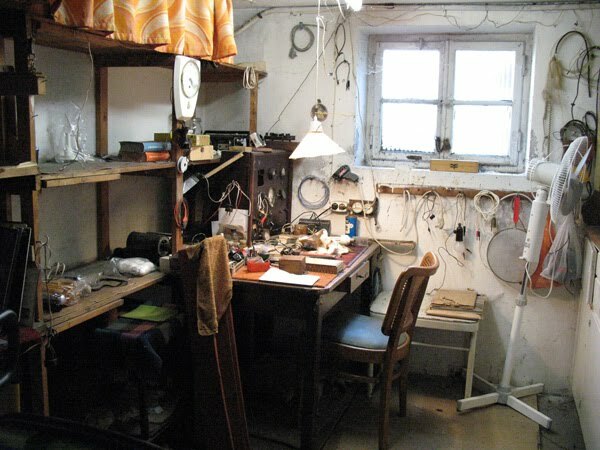 I especially wanted a photo of the little cellar workshop that my grandfather used to fix up old radios and small appliances as a hobby. It has remained untouched since he died in early 2000. Here are two photos, one of my grandfather's workroom and another of my grandmother's kitchen. I realize these photos mean nothing to you, but to me they are filled with memories of helping my grandfather find a fuse for his latest project and hearing stories about his life as a German soldier in WWII. And eating my grandmother's homemade oatmeal almond cookies or German fried potatoes and chatting about my father's life as a small boy. I spent many wonderful hours in these tiny rooms, and I love these simple images. Well said Rita... thank you for sharing! I wish I had more photos of the tiny 800 sq ft house I grew up in but I didn't have a flash for my little Box Brownie! That is so funny! I do take pictures of all the spaces that my kids inhabit from time to time. When I have been going through and deleting my old 2009 pics that didn't turn out, I run into them from time to time and wonder if I am just crazy to take pictures like that....well, thanks to you, I am on the right path! After my husband's grandfather died, I did go around with my camera and take all sorts of pictures of the house as it was remembered at that time. I am glad I did since that house is no for sale and empty and no longer has their precious memories in it. Thank you for the reminder and I will be sure to even take more pictures! My husband and I meet at a grocery store. We both worked there! Really enjoyed your post. What a great reminder about the little things. Wonderful reminder, Rita. I often think about the house my mother grew up in. In my mind it was a grand house with beautiful gardens. But all I have to remember this by is my memories. I never thought of it in this way Rita! As a kid, my fondest memories were of the house we had in the country, before my parents were divorced. It represents so much to me and I often think, "If only I could take one last look inside...." If I had pictures, that would be solved. No kids of my own yet, but, I will keep this in mind from here on out. What a beautiful sentiment you have, your photos teared me up. Hi Rita .. Im new here to your blog. thanks much for all of your generosity .. it is so helpful to a newbie elements user like me .. someone who wants to beef up a pic a little with no clue how to do it!! this is not something i've thought much about, especially the bathroom! but it is a good idea.i know how much i love to pour over a photograph of my childhood home. You are so right! My Grandma's house is ingrained in my memory but now that it has been leveled, words just wouldn't describe all its idiosyncrasies. I was just thinking that!!! Too funny..I do need to take more photos of our rooms...I'm headed out to my grandparents farm...where they have lived for 55 years to snap photos there too. Thanks for the reminder! How lovely you have got these shots. I only have a few of my grandmothers house, how glad I was that my Dad didn't take all close ups. I still have one of her ornaments; you should have heard me squeal when I saw it in one of those photos on her mantelpiece. Oh and I stayed for a couple of weeks in Bremen as a teenager. The choir I was in came over from the UK to sing in the Cathedral, and I got to say with an awesome family. Bremen is very beautiful. I'm so glad you shared this Rita...My father grew up in Bremen too...he and my grandmother came to the States after WWII...so your post really hit home for me. Thanks. Well said. And nice reminder. Your post brought tears to me eyes, and especially the pictures...brought back memories of my own grandmothers home for me, and how much we take for granted, like our mind and how much we "assume" we will remember. This was meant for me today! My dad was also a German soldier who spent 5-1/2 yrs. in a Russian POW camp. He was only 23 when he was released. I deeply, deeply regret not paying attention when he tried to tell us his story. Why must we leave it until it's too late? I'd love to talk with you about Germany over a coffee! If only we could. Wonderful post, Rita. I enjoyed learning more about you! You have motivated me to dig out the old photos from years ago. Thanks so much. i luv this site! thx 4 sharing your knowledge! i'm ashamed to say i don't know ANYTHING about photography (or computers..so embarassing) even tho i have this fab camera my hubs bought me years ago, nikon d50 w/ tamron 18-250mm lens. i take pics like crazy but i'm just using the original camera settings. anychance you could advise about basic photography 101 or the top thing i should know and do?? thanks soo much for any help. Wonderful idea....I do have a few but wished I had more ~ especially my Grandmother's old house. Reading your post made me cry! I think that is SO wonderful that you got pictures of your grandparents home. I no longer have the chance to do that. Those rooms are beautiful to me, too, because I value, too, that connection with the past and having something visual to help you remember the things you might otherwise forget. Very precious...thanks for sharing! I love the German connection, too, since it was my major in college. Vielen Dank! Great post! I treasure all the memories of my grandparents and wish I had more photos of them and their homes. I often dream of my grandparents and being at home with them, and the images are so real and so vivid; but, when I am awake, I sometimes have a hard time remembering details. It would be so nice to have the photos to reflect on.